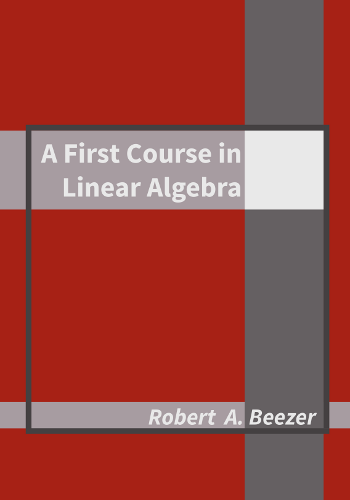 A First Course in Linear Algebra is an introductory textbook designed for university sophomores and juniors. Typically such a student will have taken calculus, but this is not a prerequisite. The book begins with systems of linear equations, then covers matrix algebra, before taking up finite-dimensional vector spaces in full generality. The final chapter covers matrix representations of linear transformations, through diagonalization, change of basis and Jordan canonical form. Along the way, determinants and eigenvalues get fair time. License: GNU Free Documentation License. This license is considered to be some to be the most open license. It allows reuse, remixing, and distribution (including commercial), but requires any remixes use the same license as the original. This limits where the content can be remixed into, but on the other hand ensures that no-one can remix the content then put the remix under a more restrictive license.